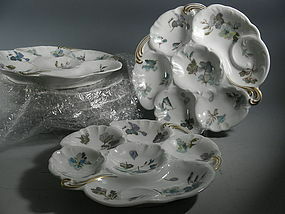 Set of six Limoges oyster plates with gold trim, In excellent condition, they measure 8.75" diameter each. Marked on back "Limoges Haviland CFH GDM France". All the same pattern, with 3 having darker flowers. Meant to be set with alternating plates.